Every family needs to wash clothes, I think we can agree on that. That makes a washer or even for some, a washer with dryer a compulsory item at home. Now that I know that you have a washer, I’m pretty sure that you had to deal with finding the most appropriate place for it. If you live in a more-less small apartment, you don’t really have a lot of choices and you simply placed your washer in bathroom and there is not very much you can do about it. Actually, in most cases it’s totally fine. My point here is that the process of regular washing over a few years period of time can and will leave smaller or bigger traces on the area you keep your machine in. Especially if you have more washers or even dryers (or combos). Probably the biggest negative side effect have dryers especially the washer dryer combos. The problem here is that the process of drying itself is destined to produce a lot of heat around the machine. If your laundry room is pretty small, or even without any sufficient ventilation system, it can get quite uncomfortable sometime. Especially in the summer as you can imagine. Place your washer machines ideally to bigger room with a good ventilation and low tendency to maintain dampness or heat. This way you can avoid future problems with a damage on the furniture around, walls or ceiling paint. This way you also significantly reduce the creation of mold in the room overall and thus maintain a lot healthier environment for you and your family. I really wouldn’t underestimate it. Make sure your washer dryer combo has a sufficient space around. You don’t want it to be attached onto the wall or a furniture for obvious reasons. Keep all the tubes, cables and electro appliances in a safe condition in the room. You can put a counter on a front loader washer to make a little bit more usable space for other things in the room. Some washers can be pretty noisy so don’t forget to take that also into account when deciding where to place it. A appropriate lighting will surely help your laundry room look more organized and clean. It will also allow you to see if there isn’t anything wrong, such as mold on the ceiling, appliances, water on the floor (which can be sometimes really dangerous, seriously), etc. One of the most important safety concerns in case you also own a dryer machine is the dryer duct. Let it install by professionals and keep it in a good condition. 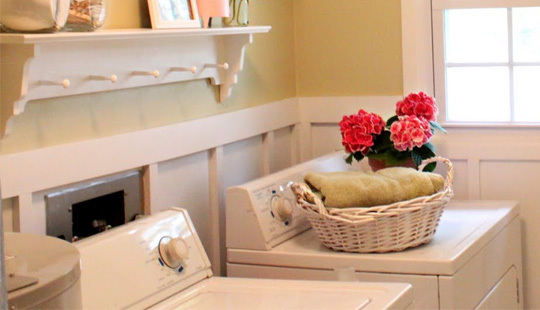 These were my quick tips on an ideal laundry room setup! Please tell me what you think I might have missed out, etc.